(2102, W. P. Campbell Collection, OHS). Pioneer attorney and politician Temple Lea Houston was the first child to be born in the Texas Governor's Mansion in Austin. Born on August 12, 1860, he was the son of Margaret Moffette Lea and Samuel Houston, who had served as president of the short-lived Republic of Texas, U.S. senator, and governor of the state of Texas. Following the death of his parents, young Houston lived with a sister in Georgetown, Texas. At age thirteen the adventuresome youth joined a cattle drive to Bismarck, Dakota Territory, and made his way south to New Orleans by working as a clerk on a Mississippi River steamboat. During his travels Houston met one of his father's political friends, who helped him obtain a position as page in the U.S. Senate. Houston's work in Washington influenced his decision to return to Texas and enroll at the recently established Agricultural and Mechanical College (now Texas A&M University). Transferring to Baylor University, he studied philosophy and law and graduated with honors in 1880. When he opened his office in Brazoria, he was the youngest practicing lawyer in Texas. He married Laura Cross in 1883. They had seven children, of whom four survived infancy. He worked as district attorney for the Texas Panhandle district, served as a Texas legislator from 1885 to 1888, and then entered private practice. Houston participated in the Oklahoma land run into the Cherokee Strip on September 16, 1893, and soon thereafter relocated his family and practice to the new town of Woodward. Famous for his flamboyant style of dress and brilliant courtroom theatrics, he often delivered monologues threaded with quotes from the Bible and classical literature. He accepted controversial cases and had a reputation as a resourceful gunfighter. A Democrat in politics, he worked for Oklahoma statehood and agreed to be a candidate in the state's first gubernatorial election. However, Houston died of a cerebral hemorrhage in Woodward, Oklahoma Territory, on August 15, 1905, two years before statehood. Sue Flanagan, Sam Houston's Texas (Austin: University of Texas Press, 1964). 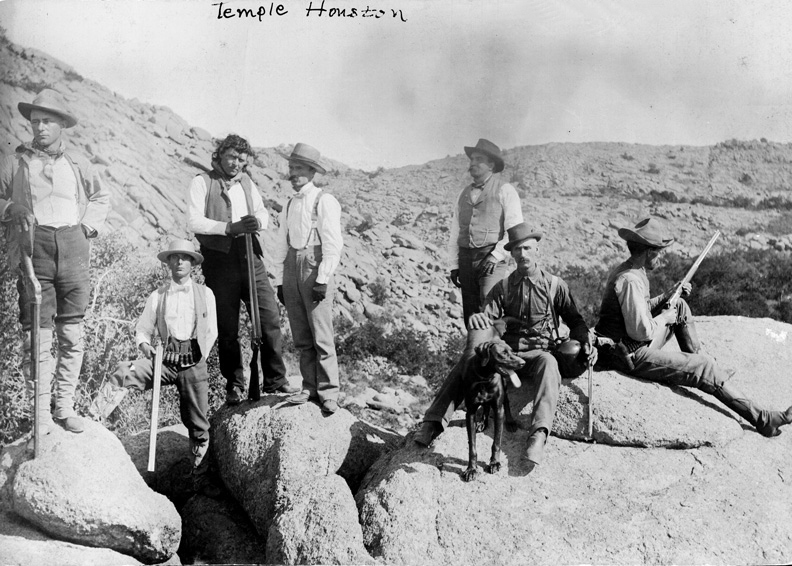 "Temple Houston Collection," Western History Collections, University of Oklahoma, Norman. "Temple Houston," Vertical File, Research Division, Oklahoma Historical Society, Oklahoma City. Bernice Tune, Golden Heritage and Silver Tongue of Temple Lea Houston (Burnet, Tex. : Eakin Press, 1981). Beth Anne Doughty, "Houston, Temple Lea," The Encyclopedia of Oklahoma History and Culture, https://www.okhistory.org/publications/enc/entry.php?entry=HO039.